No hair dryer, light bulbs in kitchen burned out and stove/microwave needed a good cleaning. May be a good idea to mention Drive and Way are different regarding name of road cabin on. All in all a very nice stay. If you are a flat lander the driveway is no joke! I would not drive it at night or in bad weather. Luckily we never encountered another car on it. Drive up in 1st gear, it makes a world of difference!The property is a great location, great proximity to Pigeon Forge, Wears Valley and Gatlinburg. It was clean and comfortable. We had all we needed. The air hockey and hot tub were nice. The rocking chairs could use an update. Check in/ out was super easy. We got to see a bear on our last night which completed everything on my bucket list. If I had any negatives to say about this cabin it would be the drive up, the trash in the back yard,and the noise from being close to the road. This by far has been our favorite cabin we have stayed in for this area. Every time I emailed or had a question and called cabins USA they were able to answer it and take care of it immediately. We have used other rental companies in the past but will definitely be using cabin USA again next time. Higher Ground met all of our needs and the scenery was beautiful. We even had a late night bear visitor at 12:30 AM on our last night.He scaled the side of the deck to come and hijack our trashcan. We Definitely have something to talk about and remember. The only downfall is the road leading to the cabin. The water was coming up over the side of the bridge upon our first night arrival. The road is very rough leading to the cabin. When I called I asked if we would be required to have a four-wheel-drive vehicle and was told no, only if it was going to be icy and snowy. I would highly recommend a four-wheel-drive vehicle for anyone in the future. We were in a 2015 Malibu and it was very rough. We had a great time though! Thank you Cabins USA! The cabin was a bit difficult to get to, even in a 4x4 vehicle. The driveway was the worst. The check out process was to simply send a text to a number but we never got a confirmation or any type of reply. The only issues with the cabin itself was the shower. The shower head needs desperately to be replaced and made water spray everywhere, also it took us a while to figure out that when you turned the shower setting to HOT it was actually COLD water coming out, and vice versa. The view would have been a bit better if some trees were cut down/trimmed though. We also had issues with racoons getting into the trash outside every night.. and the trash wasn’t even ours. It was there when we arrived. We did enjoy the nice kitchen appliances and the air hockey table though. You better have a 4 wheel drive to get up here. The road is terrible. Mainly just dirt and potholes. Cabin was great. Booked Higher Ground 5 months in advance and glad we did. The cabin was great for my family of 6. If you want to be off the beaten path then this is definitely the place. Fantastic views and extremely secluded. We loved the cabin!! The only thing that needed anything was one of the lamps on the side table needed a light bulb in it. We felt so welcomed by the popcorn and hot chocolateix in the basket on the counter!! The road to the cabin was a little hairy, but we made it up the mountain and the view was worth it!!! Thanks so much for making our 1st stay so nice!! We will book again with Cabins USA!!! Had a great time at a great place! The cabin was nice and the view was great! Although we missed the color changing of the leaves, the view was still awesome! The staff was great despite the crowd at the office (lot of people lined up to check in). I had a hard time with the pre-check-in (which would have alleviated the crowd), but should be able to use it in the future. If I had only one complaint, it would be the road getting to the cabin. There were a lot of holes in the uphill road that need to be fixed up (I drove a Jeep, so it wasn’t as hard as it would be on regular vehicles). Will definitely do this on an annual basis! It was such a good place! The only thing is that the windows and door was unlocked when we arrived and they said all that should be locked. This was our first time staying in the smokies, overall we loved it! The cabin pictures could definitely be updated. The view was amazing, we will be coming back for sure! This was the first time staying in a cabin and I will say we will always stay in a cabin with cabins USA from now on. The cabin was very clean, the view was awesome, and it was simple to check in and out. We really enjoyed our stay at this cabin! Much better than we thought it would be! Pictures should be updated beings it is way better than the pictures uploaded at this time! We hope to have this cabin every year from now on! Thank you and it’s absolutely beautiful! This was our 3rd time renting through Cabins USA. 2nd time at Higher Ground. We stayed at Higher Ground back in 2015. We fell in love with it then. The cabin has great views and is beautiful, but like most older cabins it needed much work. We looked past all the minor things and really enjoyed our stay. Fast forward to 2018 and we decided we really wanted to stay here again. Not sure if the cabin has a new owner or the original owner decided to make some improvements. Needless to say we were very pleased with the upgrades. New furniture and TV’s. You can see evidence of other maintenance repairs too. The trees have been cleaned up and some taken down. We loved the addition of a picnic table right next to the grill beside the cabin. Now don’t get me wrong, there’s still work needed to be done (Especially on the back deck) but if what we’ve already seen is any indication of things to come we will definitely be back. The view is absolutely worth the ride up. Wildlife is abundant. We had a bear climb into the back of our truck. Thank you to the owners of the cabin and a big thanks to Cabins USA for once again making this stay so easy and enjoyable. We will definitely be back. Thank you so much for your kind words, Judi! We love hearing feedback from our guests. We are glad you had a relaxing stay in Higher Ground and enjoyed all the cabin has to offer. Be sure to visit again as this cabin has a new owner who plans on updating the cabin! We are so excited for you to visit us again! Awesome view of the mountains! The "smoke" coming from the mountains was amazing to see as it moved through the valley. Very clean, well maintained cabin. Decorated with a true country feel. Very quiet, remote area to enjoy nature. Heavy rainfall washed the gravel from the road in places, but was still very manageable. We have already looked ahead at dates to return! The cabin was everything we could have ask for!! It is very well equipped and comfortable! We enjoyed our stay tremendously ! Will recommend this property to our family and friends! Wonderful cabin, very clean, enjoyed our time there. Higher Ground is an amazing place for a cabin. The views are breathtaking and the cabin was very clean. I liked the express check-in and the express checkout which saved the hassle of going into the office for the check-in process. The customer service was excellent. Overall I would definitely want to come back to this place for a great vacation. I would recommend it to friends and family for sure. The cabin has some safety issues that need to be addressed. There is a broken tile in the bathroom floor that someone could cut their foot on if they are bare foot. The screen in the portion where the hot tub is needs to be replaced. Several screens are out and this can allow insects and wildlife access to the area. Overall we enjoyed the cabin! We loved our stay at this cabin. Our only complaint would be the branches that rest on the roof. The last night in the cabin, the wind was blowing so hard and the branches kept rubbing up against the roof. It made a terrible squeaking noise that kept us up literally all night. We downloaded a sleep machine app to try to cover it but it still was louder than the app turned all the way up. We had to call for the door to be repaired so it would lock. The door had not been locked in quite some time the dead bolt didn’t even match up to the door frame. The TV in the living room became very fuzzy and you could not get a clear picture after the first day we were there. The TV in the bedroom was not even connected to Cable so that was not a option when the TV in living room wasn’t clear. Water pressure in shower was poor. The cabin just needs to be updated with some maintenance issues. I was disappointed in how much litter was behind this cabin. It does need some repairs on the screen porch. Bigger flat screen TVs would be a nice upgrade as well. We loved the cabin and the view. The drieway was a little scary especially when you needed to pass another car. We have been visiting the area for years and this is the first time we rented through Cabins USA. This cabin is in a perfect location if your looking for a great view of the mountains! If you are looking for quietness - you can hear the cars on Wears Valley Road. We had a bear visit the last night we were there so keep that in mind when staying in this more secluded area. We had a great week and we will be renting through them again! The only con I would give Higher Ground is the lock on the door can be hard at times and the window on the door needs to be replaced. I advised Cabins USA of this as well as ripped screens on the porch downstairs - but I guess that's normal with bears and other animals around! We stayed at Higher Ground for 5 days. Overall, we had a good experience. I will advise the drive way to get to the cabin is very steep and a little scary. There is plenty of room. The bed in the downstairs room was very uncomfortable but the bed in the main room was comfortable and cozy. We didn't have any cleaning supplies so it made it hard to clean things up while we were there. We did manage to find a broom hidden in a closet, but the floor was very sticky when we arrived which meant we couldn't walk around without socks and/or shoes on. Overall, we had a great stay and I would definitely recommend Cabins USA. The entire experience with Cabins USA was wonderful! We have recommended them to friends and family and already have people looking to book with them! The cabin was everything we had hoped it would be. The pictures were very accurate and we got exactly what we expected. The drive up was kind of difficult when we first got there because we arrived late at night, the directions Cabins USA provided were incredibly helpful. The cabin location is convenient for going to Gatlinburg, Wears Valley, Pigeon Forge, Cades Cove, etc. We were also very happy with this. Flaws: The bedroom door is a sliding barn door and one side was off the track so it wouldn't close. We let the office know and they offered to send someone out to fix it, which we weren't worried about. It was just two of us there so we didn't really need it to shut. The screened in porch had tears in the screen, we also let the office know about this and they didn't seem too concerned, but on our second day there we noticed that the holes and tears had tripled! I'm guessing this happens frequently, and it also didn't bother us (we mostly just wanted the office to know that we weren't the ones causing the damage). Some other reviews stated that the hot water didn't work in the shower... I took 2 cold showers before figuring out that the hot water DOES work, the handle is just backwards, not a big deal once we figured it out. Overall, we are very pleased with the cabin and office staff. The few tiny flaws didn't do anything to hinder how happy we were with our stay and are already looking at coming back twice next year. I highly recommend Cabins USA and Higher Ground. Thank you for all of your kind words! We here at Cabins USA strive to give each of our guests the best stay possible while vacationing in the Smokies. Thank you for letting us know about the screen and door. Maintenance has been made aware is working to correct that. When you are ready to stay with us again, please mention you are a return guest for an additional discount. Thank you for choosing Cabins USA and we look forward to having you as our guest again soon! Outside of cabin was a little rough, older park style grill, broken main window covered with duct tape and outside light is connected to the inside ceiling fans. Inside of cabin was clean, we'll stocked and beautiful. Thank you for taking the time to let us know about your recent stay in Higher Ground! We here at Cabins USA strive to give each of our guests the best stay possible while vacationing in the Smokies. Once our maintenance department was made aware of the situation with the window, we contacted our vendor and are in the process of having that repaired. Thank you for choosing Cabins USA and we look forward to having you as our guest again soon! Had a fabulous stay for 3 nights in Higher Ground...Beautiful cabin had all we needed...Only thing I found wrong is that I forgot to check to see if it had Wifi before booking...I used all my data..so therefore next time i will pick onecthat has wifi...but it will be one of these..View was fantastic and so breathtaking...loved all the window views...and getting to dine at table with a mountain view..Looking forward to staying in ine of your other cabins next trip up...And btw dont know why all the bad reviews about the trip up the mountain..It was no problem for us whatsoever..Probably during snow or ice you woukd need a 4 wheel drive but guess i can say I have been to worse places..Till we meet again!! Thank you for all of your kind words! We here at Cabins USA work hard to make sure each of our guests have the same great stay you enjoyed while vacationing in the Smokies. When you are ready to stay with us again, please mention you are a return guest for an additional discount. Thank you for choosing Cabins USA and we look forward to seeing you again soon! My girlfriend and I stayed in this cabin for a weekend trip. Overall, we had a good experience with both this cabin and Cabins USA. Pros: Checking in and out was simple, and the staff was friendly and helpful. The cabin was clean and welcoming, the bed was comfortable, and the view was stunning. Air hockey table was an added plus. It's in a great location too, really close to Pigeon Forge. Best part (aside from the view) is the peace and quiet. Cons: Hard to find at first. We checked in late at night, and missed our turn multiple times because the signs are small and hand painted. Our phones didn't have service, so we couldn't call for directions. It's up on a narrow gravel road, which can be difficult to navigate. A possible negative for some - no WiFi. Lastly, the cabin says it can sleep 6, but there was only one fork in the drawer. All pretty minor flaws, except for the road signs. Some spotlights would really help, especially at night. I recommend this cabin to anyone looking for a place with a nice view up in the mountains. We would stay here again, but look forward to checking out other options from Cabins USA as well. Thanks for the great trip, we really enjoyed our stay! I am so happy to hear that you enjoyed your stay in Higher Ground! We here at Cabins USA work hard to make sure each of our guests have the same great stay you enjoyed while vacationing in the Smokies. I apologize for the difficulties you experienced finding your cabin. Your comments have been forwarded to our Owner Liaisons who will bring this to the owner's attention. Housekeeping has also been notified of the lack of silverware and will be correcting that as well. When you are ready to stay with us again, please mention you are a return guest for an additional discount. Thank you for choosing Cabins USA and we look forward to having you as our guest again! The cabin was nice. I enjoyed my stay. Great value. My only complaints are about the driveway/parking for Higher Ground. There is a giant pothole that makes it difficult to park at the property. Overall the cabin was very nice and location was gorgeous! We had morning coffee on the back deck every morning. We felt very at home! However, looking down from the deck there was alot of garbage laying around. The cleaning crew could have done a better job in the bathroom, I had to clean the shower before using it and there were lots of spider webs. Now, the parking area needed LOTS of work to fill in the two large holes , using a standard auto, without 4-wheel drive, to park next to the cabin, was next to impossible. Also the fence needs major attention. But honestly, i will use your company to book our vacation rentals. Everyone I talked to were extremely friendly and helpful. Direct TV remote wouldn't work. Called Cabins USA and they said they would send someone out to fix it but no one ever came. The staff at CabinsUSA were great as always. Higher Ground had the best views of the mountains I have personally ever seen! I feel the cabin is lacking however. The lower floor bedroom has no television, bathroom, or dresser. The main floor bedroom television only plays DVDs and has the only bathroom in the entire cabin. The biggest downfall is the lack of hot tub. With a view like that, it would be amazing to relax in a hot tub to enjoy it! Thank you for taking the time to let us know about your recent stay in Higher Ground. We here at Cabins USA work hard to make sure each of our guests have the best stay possible while vacationing in the Smokies. Thank you for all of your suggestions. We are continually looking for ways to improve our guests' experience and your comments have been forwarded to our Owner Liaisons. Thank you for choosing Cabins USA and we look forward to seeing you again soon! Higher Ground was a great cabin...beautiful view from the porch, clean, comfortable and very much worth the cost of the rental. The staff at Cabins USA was friendly and helpful, and the online check in and check out process was flawless. Can't wait to come back again! The only thing that I didn't like was the road to the cabin was rough. Other then that everything was great. Will rent with cabins USA on my next stay. My family and I really enjoyed our time there! A beautiful view to sit and drink coffee/tea! The beds were extremely comfortable! The only complaint I have is that the water pressure in shower is'nt quite high enough and also it wouldn't always get hot! It seems the faucet is hooked up wrong. Other than that I would definitely rent from them again for a Smoky trip! Thank you for taking the time to let us know about your recent stay in Higher Ground! We here at Cabins USA work hard to make sure each of our guests have the best stay possible while vacationing in the Smokies. Thank you for letting us know about the issue with the water pressure. Maintenance has been notified and will be looking into that issue. When you are ready to stay with us again, please mention you are a return guest for an additional discount. Thank you for choosing Cabins USA and we look forward to having you as our guest again! Tub spigot needs to be fixed, coming loose from the wall. Thank you for taking the time to let us know about your stay in Higher Ground. We here at Cabins USA work hard to make sure each of our guests have the best stay possible while vacationing in the Smokies. Thank you for letting us know about the tub spigot. Maintenance has been notified and will be correcting that issue. Thank you for choosing Cabins USA and we look forward to having you as our guest again! Thank you for all of your kind words! We here at Cabins USA work hard to make sure each of our guests have the best stay possible when visiting the Smokies. When you are ready to stay with us again, please mention you are a return guest for an additional discount. Thank you for choosing Cabins USA and we look forward to having you as our guest again! The views from the cabin are as advertised, very beautiful ! It's location to town was very convenient. I felt the rates for what you got were very fair and reasonable. The only thing I would suggest inside the cabin would be to have more hangers in the closet so guest could put up their clothes, we only had 3 or 4 hangers. Also maybe provide a couple more towels for the bathroom for showering. Outside the cabin the only suggestion I would make is to patch up the driveway, it was a little step with loose gravel and had a pothole, I had to engage my 4 wheel drive to get up it the 1st night until I could see better the next day to maneuver around it to gain a better angle to enter the driveway. Overall though, the complete stay was a solid 9 rating out of 10 and I would return again and make the suggestion for others to do so also !! We have been wanting to get to the Smokeys, and finally were able to do so. The view from the deck was everything we hoped it would be, and couldn't have been more satisfied with both the service of the staff and quality of our cabin. We had wild turkeys roaming in the driveway, beautiful views of the mountains, comfortable beds and a very clean and welcoming cabin. The short drive to Pigeon Forge allows for easy access to dining, shows and other entertainment. We plan to make a return trip, and will definitely be returning our business to Cabins USA. Very pleasent stay, cabin was just like the photographs. Kinda a cold shower and the bed was as stated in other reviews. The was some trash around outside but as windy as it gets I can understand why. Would diffenilly rent from cans usa again. Thank you for taking the time to let us know about your recent stay in Higher Ground. We here at Cabins USA work hard to make sure that each of our guests have the same great stay you enjoyed while vacationing in the Smokies. Thank you for letting us know about the trash around the cabin. Housekeeping has been notified and will be correcting that issue. Thank you for choosing Cabins USA and we look forward to having you as our guest again! I loved the view! It was my first time seeing the mountains so I really enjoyed waking up to them every morning during our stay. Can't wait to do it again!! Thank y'all so much! Great cabin! Downstairs room was a little chilly, bring a space heater with you if you go in winter time. Awesome views, great staff and easy check in and out! Will definitely stay again! Thank you for all of your kind words! We here at Cabins USA work hard to make sure that each of our guests have the same great experience you enjoyed while vacationing in the Smokies. When you are ready to stay with us again, please mention you are a return guest for an additional discount. Thank you again for your review and thank you for choosing Cabins USA! We loved the cabin, and will definitely stay there again. The view is awesome! It's a great location, just a short drive to all of the area attractions. There is plenty of dishes and utensils for cooking, a dish washer for easy clean up, more than enough towels, and a washer and dryer if you run out. The king size bed may be more comfortable than the queen, but I don't know. We didn't use the larger bed. The view was too nice in the down stairs bed room to pass up. We have no complaints about our stay. I thought having no Wi-fi might bother me, but I didn't really miss it. I just enjoyed the cabin. I am so happy to hear that you enjoyed your stay in Higher Ground! We here at Cabins USA work hard to make sure that each of our guests have the same amazing time you enjoyed while vacationing in the Smokies. When you are ready to stay with us again, please let our reservationists know you are a return guest for an additional discount. Thank you again for your review and thank you for choosing Cabins USA! Loved the cabin and it's location was beautiful. We had a great time, just not long enuff. We will be back soon as we can. I would highly recommend your cabins. I am so happy to hear that you enjoyed your stay in Higher Ground. When you are ready to stay with us again, please let our reservationists know you are a return guest for an additional discount. Thank you again for your review and we look forward to seeing you again soon! awesome view, it's nice to get away from everything so this is the perfect place!!! I am so happy to hear that everyone enjoyed their stay in Higher Ground! When you are ready to stay with us again, please let our reservationists know you are a return guest for an additional discount. Thank you for choosing Cabins USA and we look forward to seeing you again soon! I love the location! The views are beautiful and the cabin is well appointed. You do need a four wheel drive to get up and down the mountain but if you're careful, a regular car will work. I believe the occupants of the cabin need to be aware of the possibility a bear might visit. We had a full grown black bear on the deck for about 45 minutes one night. He was not aggressive but the back wall of the cabin is all glass which made having a bear on the deck a little more terrifying. The young lady who answered my emergency call to Cabins USA was super! She remained calm and she did everything she could to find someone who could help us with this event. Unfortunately, none of the police departments she called felt it was their responsibility to handle the situation, referring to the bear on the deck as a non-emergency - to me, it felt life-threatening. Cabins USA did a great job in trying to resolve the issue but potential occupants need to be aware that the cabin does sit in an area where bears are comfortable and common. Thank you so much for your kind review! Our staff is always happy to help our guests in any way possible. I am happy to hear that the person who answered your call did her best to resolve your bear issue. Thank you again for your review and we look forward to having you as our guest again! The shower has very little water pressure and the cold and hot is backwards on the tub. Besides that the cabin was amazing!!!! The view is breathtaking !!! We can't wait to be back for our next vacation!! The cabin was beautiful, the view was amazing. There weren't enough towels in the cabin and the hot and cold water was backwards in the shower, we should have been made aware of that before calling maintenance. Those were such minor things. The stay was wonderful and great family memories were made that weekend. Absolutely would rent from Cabins USA again. Thank you for your review. We are glad that you enjoyed your stay with us. We do highly recommend a four wheel drive in times of inclement weather. We appreciate your feedback on your stay with us and we hope that we will hear from you again soon. We did not have hot water in the shower. Thank you for your review. We apologize for any inconvenience that occurred during your stay. All issues have been addressed. We hope that we will hear from you again soon. There was alot of traffic noise from the highway below but other than that we really enjoyed our stay. The cabin was very clean and extremely comfortable. The view from everywhere was amazing and a scene that just continued. We are definitely going back next year but bringing more family with us. The driveway may be a bit difficult getting up but most roads to most cabins are just have to take it slow. They had sufficient blankets and pillows and the master bed had an eggcrate topper on the matress which made it super comfortable. The cabin was located about 4.5 miles from the main road and attactions, which was close enough to get to and far enough not to hear all of the traffic. There is also a Kroger Supermarket super close which makes it extremely convinient. Looking forward to vacation next year. Cabins USA was very accomodating and great to work with. The listing said there was a hot tub and there was not. Advertisement misleading. However, it was a good stay. Thank you for your review. We are glad that you had a good stay with us. This cabin does not have a hot tub and does not advertise one. The cabin does however, feature and indoor jacuzzi that is advertised online. We hope that we hear from you again soon. Please feel free to give us a call so that we can assist you with finding a cabin that provides all the amenities you would like. We hope to hear from you soon. The beds were horrible and there was not a hot tub like advertised. Thank you for your review. We apologize if you were inconvenienced during stay. We will have the beds inspected immediately. This cabin does not offer a hot tub, but it does offer a jacuzzi tub inside the cabin as advertised online. We hope that you will choose Cabins USA again for a future stay. Please feel free to give us a call and allow us to help you find a cabin that has all the amenities you would like. The cabin has spectacular views. The master bed was comfortable, while the lower level bed may need a new mattress. Everything we needed was there. It was like we were at home. I loved it! We stayed at Higher Ground for a full week. We had a GREAT time in this cabin. The queen bed room on the bottom floor gets very cold, but you can add extra blankets. The ceiling fan in the king bed room did not work and the mattress in that room was very uncomfortable. If you book this cabin...you will enjoy it, but take an egg crate or something to add to the queen bed. Very easy to get to and close to everything. The view is also outstanding. It far out weighs the little things that didn't work and the uncomfy bed! We would gladly stay in this cabin again! Thank you for your review Shelly. We are delighted you had a great time at Higher Ground. We appreciate all of your feedback. We have fixed the fan, and the mattress and bed are being inspected. We hope that we will hear from you again soon. Please feel free to call us and allow us to assist you in making great accommodations in the Smokies. This is a beautiful cabin. The beds could be a bit more comfortable. It is close to everything but far enough away to make you forget. Very peaceful. I can't wait to go back. The young lady at check in was so sweet and helpful. I thought I had read in my original search that this property had both a Jacuzzi and a hot tub. There was no hot tub and the Jacuzzi was a regular width/length bath tub just a bit deeper with jets. It was hard to tell in the pictures but I assumed it was a large Jacuzzi like many of the other ones pictured in the master bedrooms of the CABINS USA cabins. That is my fault I should have done better research. But even if it had been a larger 2 person tub, we would not have been able to use it with ease because like other reviews of Higher Ground have stated, there was not much in the way of hot water to the shower/tub. The kitchen skin, dishwasher, and washing machine all had very hot water though so there is not an issue with the cabin, only the tub. I did fill the tub with cold water and run the jets to assure the tub and jets were clean one night when I was needing a soak. We drained the tub and then I filled it with the luke warm water that comes out when you have it all the way hot, my husband boiled a few pots of water but when the jets were turned back on there was a bit of mildew that came out (It must have been dislodge during our initial cleaning). This is fairly normal for jetted tubs that don't get regular use, but I decided to pass on the soak. The kitchen was clean and all the necessities for cooking in were there. We used all the dishes and utensils provided other than a mini crockpot which I brought along. Dish soap, a rag, and dishwasher detergent were provided as long with trash bags, toilet paper, and paper towels. The kitchen was spacious and I enjoyed cooking in it. There were a few cups with lipstick marks but again dishwashers do not get everything so I just washed everything before use even if it appeared spotless. The deck was great the view is breath taking. It is a bit of a haul up the side of the mountain but we have a PT Cruiser and it made it with no trouble. Parking, although it looked intimidating, was no issue either. We made it up and down the mountain at least twice a day with no troubles. The downstairs bedroom has an amazing view and has a very comfortable bed. We did sleep in the master bedroom because of the king bed and bathroom right off the room. The King mattress was thinner than the other for sure. I covered the bed and sheets already on it with my own sheets from home (personal preference) and we slept well every night. All in all even with the small disappointments it was a wonderful week. The view is amazing the cabin is homey. The best advise I can give to ensure your stay at any place like this is wonderful would be to bring along the essentials whether the company says they provide them or not! A set of sheets, blanket, and pillow for the bedroom. Beach towel, extra roll of toilet paper and paper towels. A bag for trash, cleaning detergent of some type and a few kitchen staples if you plan on cooking in. Better safe than sorry! Although you will more than likely not need these items, if you do you have them and there is no inconvenience. I know this seems extensive but we were 12 hours away from home for a week and I didn't want to hit any bumps in the road so i prepared for everything so I could enjoy our time and feel that we got our money's worth. We will be back for sure, although we did talk about looking for a more romantic cabin should it just be the 2 of us again. This is the third year in a row that we have rented through Cabins USA, and the second year in a row that we have stayed at "Higher Ground". I have consistently made my reservations through Drewscilla, and have always been satisfied at how accomodating she is, and willing to work with me to make sure that we are happy, and that our needs are addressed. 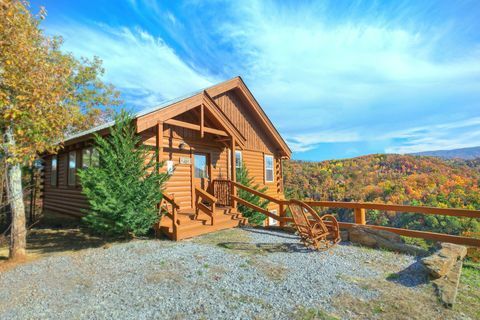 I have been asked several times for references from friends who are contemplating going to Tennessee on vacation, and have recommended Cabins USA each time. We have not been let down as of yet, and have always been treated very professionally by the staff and crew, and have thouroughly enjoyed each of our stays, and will continued to go through Cabins USA for our future visits to TN. We really enjoyed our stay at the higher ground cabin. It was secluded and far enough away from the hustle and bustle, yet close to shopping, dining and activities. The view was breathtaking! We would highly recommend this cabin. Thank you for choosing Cabins USA. We are so delighted that you enjoyed your stay at Higher Ground, and that Higher Ground met your needs. We hope that you will keep us in mind for your future stay in the Smokies. We had a wonderful time and loved our cabin. Thank you so much! Higher Ground was wonderful! We had amazing views and everything that we needed to feel at home for 3 nights. There were more than enough pots and pans and the beds were very comfortable. I would recommend the downstairs bedroom. The view is not to be missed. The air hockey table did not work, but the location was so spectacular that we didn't miss it. We loved the cabin but hated the road up to it im glad we didnt meet anyone on the road or we would have had to get in the ditch. Great view, beautiful cabin with wonderful wood floors. THE STAFF WAS GREAT. THE CABIN AND THE VIEW WAS GREAT. FOR THE MOST PART THE CABIN WAS CLEAN EXCEPT DEAD FLIES IN THE KITCHEN SINK AND DUST AND COBB WEBS IN THE WINDOWS. THE MATTRESS WAS VERY COMFORTABLE UPSTAIRS AND DOWNSTAIRS. WISH THERE WAS TWO TVS. WE HAD TO STAY EXTRA NIGHTS DUE TO FLOODING ON THE ROAD TO THE CABIN AND THE STAFF WAS GREAT AND VERY HELPFUL. WE WILL STAY AGAIN. Thank you for your recent stay in Higher Ground. We do apologize that you were unhappy with your first cabin and had housekeeping issues. These issues will be addressed with our housekeeping staff immediately to ensure that they are properly taken care of. We do hope that you will come and stay with us again in the near future. Again, thank you for choosing Cabins USA. Awesome stay! The only suggestion we have is to have another television in one of the bedrooms for children. This place was awsome. The view was beauitiful. My only complaint was the bed was a hard. But besides that it was fantastic. I would stay there again. Very much enjoyed the stay,private,well off the beaten path.Very clean,only issues encountered was a blind missing in the bathroom,a screen damaged on the lower deck,the time of year when wasps were beginning to come out.Stopped by the cabins usa office,reported this,by the time we arrived at the cabin for the evening someone had already arrived to take care of the wasps and install a new blind for the bathroom.Very quick response,would definitely stay with cabins usa again. Need more pots and cooking iteams thats not something people usually think about bringing on vacation! bed are hard and uncomfortable!